One of my favorite guilty pleasures when it comes to sweet treats is cake pops. They’re super cute, fun to eat and oh so decadent. My family loves them too. My son not only loves to eat them but to help make them too. He really likes to get his hands in the cake to make the crumbs, and what kid doesn’t love to dip things in chocolate? Because Valentine’s Day is coming up, my son and I decided to make some fun Cake Pops for the ladies in the office at his school. He had the great idea that teachers always get lots of goodies, but the administration in the office can sometimes get forgotten. So he’ll be taking these yummy little treats to the office tomorrow morning. For these cake pops, we started with a Pillsbury boxed Devil’s food cake mix. But instead of making the cake with water like the directions say, I added Dunkin Donuts Coffee and milk. This adds lots of delicious coffee goodness as well as some creamy goodness from the milk. 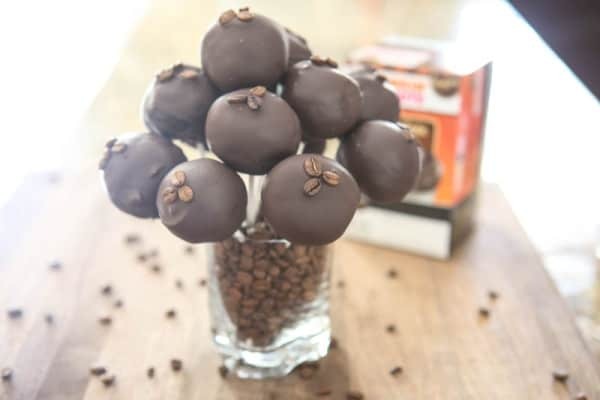 I used Dunkin Donuts Chocolate Glazed Donuts Bakery Series Coffee for these cake pops. This coffee is so delicious. I have a stockpile of it in my pantry. It’s one of my absolute favorites. 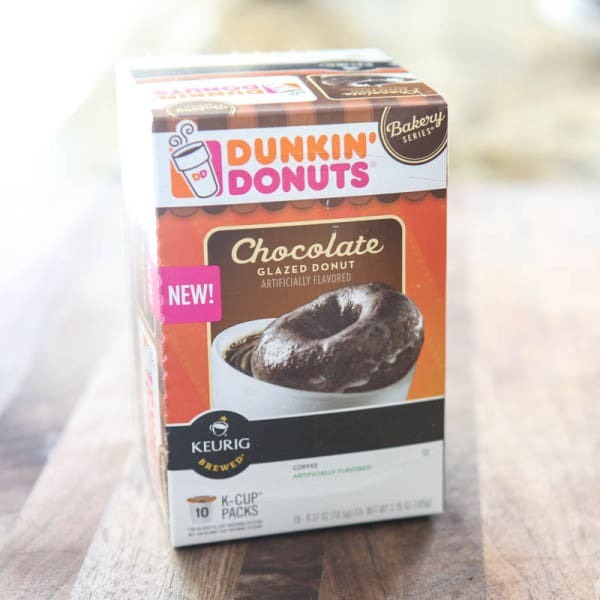 Dunkin Donuts Chocolate Glazed Coffee also comes in K-Cup, so you can easily brew it in your K-Cup Brewer. After we baked the cake and let it cool, I crumbled it in a large bowl and added a can of cake frosting and mixed it well. Then we formed the cake balls, about the size of golf balls with a large cookie scoop. You can make them any size, we like to make them a little larger. Then we placed them in the freezer for a while, and melted the chocolate in the microwave. The cake balls need at least 15 – 20 minutes to cool in the freezer. This makes sure they don’t fall apart when you dip them in the melted chocolate. To dip you’re cake balls, dip the lollipop stick in the melted chocolate first before inserting it into the cake ball. Then gently dip it in the melted chocolate. 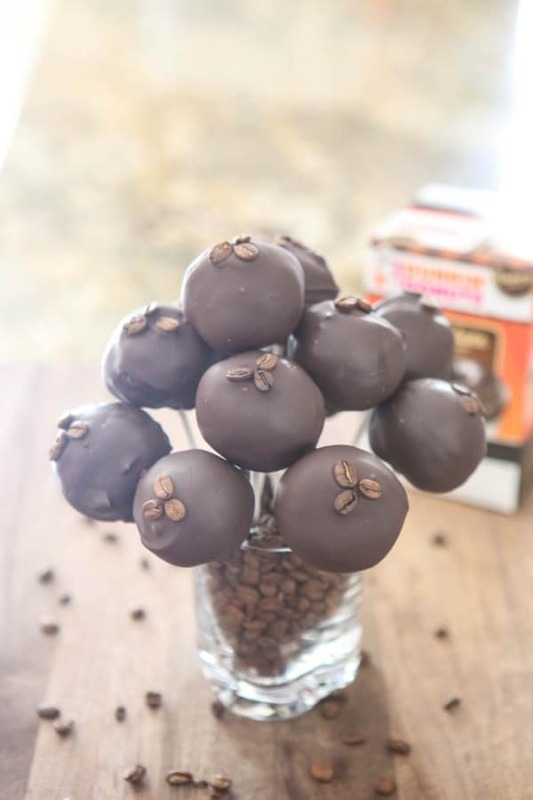 Garnish with a few coffee beans and insert in a cake pop holder or a piece of styrofoam for the chocolate to cool. Dunkin Donuts Coffee has a wide variety of amazing coffees that are available at your local grocery store. My husband’s favorite coffees are the different roasts. They have columbian, french roast, a dark, a turbo, a decaf, and their original blend. My favorite coffees come from the bakery series line. There’s blueberry muffin, chocolate glazed donut, vanilla cupcake, caramel coffee cake, old fashioned donut and cinnamon coffee roll. They also have more familiar flavors like french vanilla and hazelnut. You can also find some wonderful seasonal flavors around the holidays. My favorite, the chocolate glazed donut is also available in the K-Cup. Duncan original, Decaf, hazelnut and french vanilla is also available in the convention K-Cups. 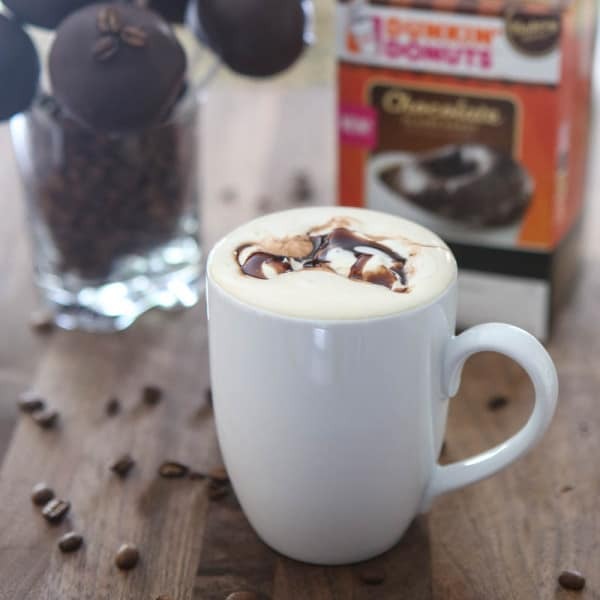 When we taste tested the cake pops today, I made myself a cup of the Dunkin Donuts Chocolate Glazed Donuts Coffee. I added whipped cream and a little drizzle of chocolate on top. It came out so good! It’s such a perfect accompaniment to these little cake pops. 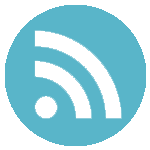 Find more about Dunkin Donuts at DunkinDonuts.com. 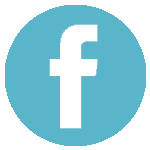 Be sure to connect with Dunkin Donuts on Facebook and Dunkin Donuts on Twitter too. 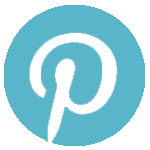 You can also find Dunkin Donuts on Pinterest. 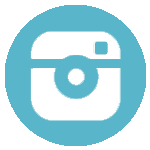 Check out Dunkin Donuts on YouTube and follow Dunkin Donuts on Instagram too. 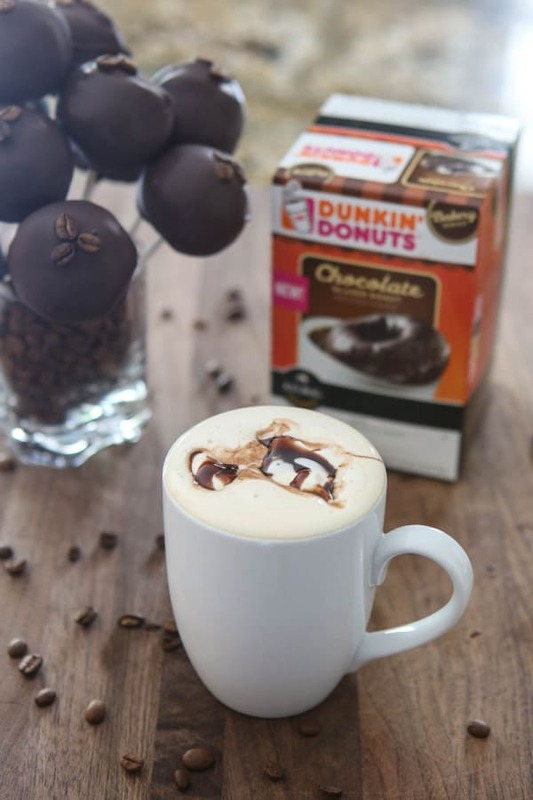 Prepare cake by package directions, substituting the 1 cup water for 1/2 cup milk and 1/2 cup freshly brewed Dunkin Donuts Glazed Chocolate Coffee. Bake cake in a 9 x 13 inch cake pan and let cool completely. After cake has cooled, crumble cake in a large bowl. Add the container of cake frosting and mix well. Using a large cookie scoop, portion cake ball mixture into balls. They should be about the size of golf balls. Place in the freezer to cool for at least 15-20 minutes. Insert lollipop stick into melted chocolate and then into cake ball. 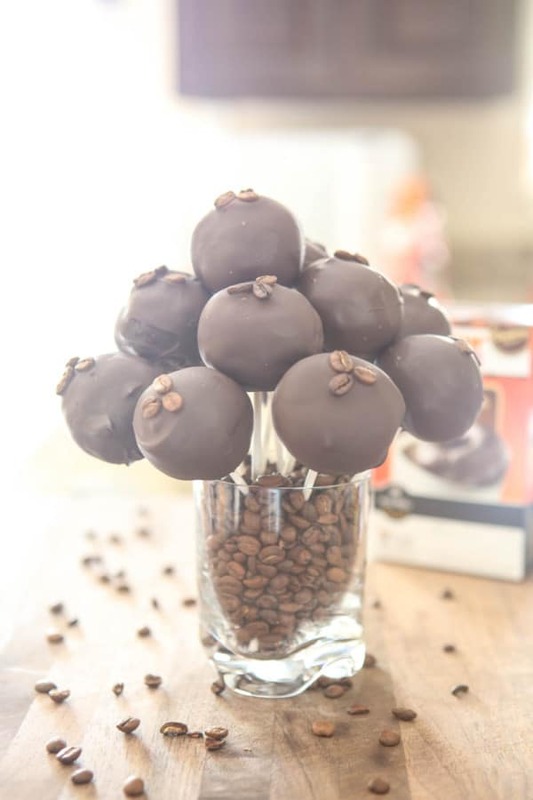 Gently dip cake ball into melted chocolate and garnish with coffee bean. Place in styrofoam or cake pop holder to set. Brew coffee and top with fresh whipped cream and drizzle with chocolate syrup. This post sponsored by Dunkin Donuts. 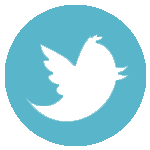 All thoughts and opinions 100% mine. Cake pops are just so cute. I love the built in portion control that comes along with them. I had no idea that glazed chocolate coffee existed. I bet it would make a fabulous mocha, too. Okay, I know this is going to sound crazy, but – I’ve never had a cake pop. Although I think they’re adorable, they’ve never really appealed to me…before now! Coffee and chocolate are the perfect combo, and I totally want to try one or three of these alongside a cup of coffee, of course. I’ve never made cake balls before, but yours seem simple enough to make, I think I can do it! Thanks for the tips! Chocolate Glazed Donut COFFEE?? Man its hearing things like this that make me wish I liked coffee, sound SO good! Love the cake pops too! Preeeetty sure I need at least 2 of these today! These are so fun! What a great idea! We love cake pops too … and these look amazeballs. YUM! I’d love to dip one of those into my coffee right now. Great job.